“Nader and Simin, A Separation” directed by Asghar Farhadi has been a surprise hit, winning the Golden Bear for Best Film and the Silver Bears for Best Actress and Best Actor at the Berlin Film Festival. It is a parable of truth and selflessness based in modern day Tehran - and it is a must-see! “Nader and Simin, A Separation” directed by Asghar Farhadi, tells the story of an Iranian middle-class couple who are trying to separate. The wife wants to take their eleven-year-old daughter abroad for a better life, but the husband resists as he is still caring for his father who is suffering from Alzheimer’s. It’s not an action-packed thriller, but the film has been a massive success, winning the Golden Bear for Best Film and the Silver Bears for Best Actress and Best Actor at the Berlin Film Festival. The film has now been chosen as the official Iranian candidate for the Best Foreign Language Film at the Academy Awards. Iranian cinema has recently been hitting the headlines for all the wrong reasons, mainly for the arrest of Jafar Panahi who was accused of intending to commit crimes against the country’s national security and for creating propaganda against the Islamic Republic. He was sentenced to six years in jail and subjected to a 20-year ban on making or directing any movies, writing screenplays, giving any form of interview with Iranian or foreign media, as well as being banned from leaving the country. The Iranian actress Marzieh Vafamehr was also given a jail sentence and sentenced to 90 lashes for appearing in an Australian movie, “My Tehran for Sale” which was critical of Iran. 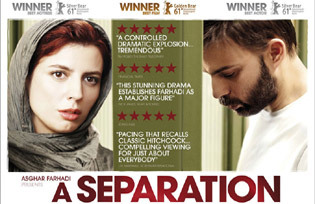 By all accounts “A Separation” has been given the green light from the Iranian authorities, perhaps because the story is more akin to a modern religious parable than a social comment on modern Iranian life. In “A Separation”, the couple Nader and Simin have been married for fourteen years and have an eleven-year-old daughter Termeh. The family are reasonably well-off, but the wife Simin is determined to leave the country to get her daughter away from Iran – exactly why is left pointedly unsaid. The visa permitting them to leave the country has finally come through but expires within 40 days. However the family situation has changed since the couple applied to emigrate: Nader’s Alzheimer-ridden father has become totally dependent on his son’s care. Nader cannot leave him. In order for Simin to leave the country with her daughter, her husband’s consent is essential. That consent is not forthcoming as we see from the very first scene, where Simin is filing for separation in a bare civil courtroom. The judge rules against her plea and sends the couple away, almost ticking them off for the frivolity of their motivations. As a result, Simin moves out of the family apartment, leaving her husband and daughter to continue their lives and look after Nader’s ailing father. They need help, so through one of Termeh’s teachers’ recommendations, they hire a religious young woman from a working-class background. Without wishing to spoil the story, the situation evolves into a morality tale fuelled by the stress of the protagonists’ lives which seem to be on the verge of unravelling at any moment. “A Separation” has an intensity to it right from the very start. Helped along by the slightly unstable hand-held camera, the debilitating tension of the story maintains a grip on the spectator that never lets go. The film is no blockbuster, it is simplicity itself. You almost get sidetracked at the outset as the issue of the couple’s separation appears to be about leaving Iran for a new start in another country, but the film quickly branches off into more complex issues such as truth, morality, alienation and egotism. Each character is slowly eaten away by their own distress, according to their ability to tell themselves and others the truth. In a sense it is a deeply religious movie – or certainly a spiritual and moral one. Do not expect a political critique of the current regime – you will find almost the opposite: the authorities come across as hard-working and conscientious servants of the greater good. The working class family of their new home-help (desperate, poor and religious) provides the counter-balance to Nader and Simir’s middle-class but equally stressful existence. Nevertheless, the episodes of class conflict are transcended by the continual efforts made by all the main characters to get to the truth in their own way. Liberation only comes with the final admission of guilt, leaving none of the characters free of the effects of that guilt. In the final analysis, the middle class couple, who are virtually ripping their daughter apart in an effort to retain control of their own lives, are guilty of the terrible egoism engendered by their own alienation and silent desperation. “A Separation” was a low budget movie, costing $500,000, a sum which has already been recouped many times over. The acting is excellent from all concerned, from the protagonists to the bit parts. Director Asghar Farhadi drags you almost physically through the streets of Tehran and into the highly-stressed lives of his characters, revealing frustration and desolation on both sides of the economic divide. It is a fast-moving and densely packed movie that deserves to be seen. Truly excellent.